Although we still see the occasional flurries here and there and are not yet in double digits in temperature, most of us are ready to shed our coats and opt for lighter layers. Soft shades of pastels are calling our names. If you are anything like me, you have started putting some thought (and maybe even some shopping) into your Spring wardrobe. On my last post, I put together some Spring staples that you can begin with as we transition into warmer weather. If you are looking for a list of basics to begin with, take a look at this list before you shop! For those of you in Toronto, you know that our days can differ by up to 20 degrees celsius at times, so wearing layers is imperative. Sometimes those sunny days can be deceiving! One of the easiest ways to shift into Spring-mode with your clothing is wearing lighter shades. With neutrals and pastels at our fingertips, take advantage of this season's most popular colours. Here's a review on this outfit. 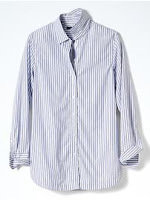 Banana Republic is one of my go-to's as they have extended sizes - major win for petites everywhere! They also carry tall sizes. Their items are great quality and are at an affordable price range (they have sales for up to 40% off many times throughout the year). I hadn't planned on it, but my coat, shirt and pants from this particular outfit are all from Banana Republic - that speaks of my love for their petite clothing line. The wool coat is a three button coat, fully lined. This has been my go-to coat since I bought it as it is so easily dressed up or down. So many times I see myself grabbing it before I am out the door because it makes an outfit look so polished. I also loved the collar as it was not overwhelming on my petite frame. The slightly raised shoulders also give it a feminine touch. The shirt underneath is a button-down in their classic fit. I used to shy away from button down shirts as I felt they were often boxy and more masculine looking but if paired right, I find them to look effortlessly put-together. I bought this one a couple of months ago and is no longer available but I have linked a similar one here. The pants I paired for this look are the Logan fit pants. (For reference, the inseams are as follows: Petite/Short: 31"; Regular 33"; Long/Tall: 35") I linked a pair in Blush Pink here. These pants have belt hoops so you can add a pop of colour with your favourite belt. If you are under 5'5, I recommend a slimmer belt. My pants are white so I chose a belt in cognac to pick up on the colour of my bag.